CHICAGO (CNS) — Archbishop Blase J. Cupich has set a goal of benchmarking all 2,700 buildings in the Archdiocese of Chicago to ensure that they are as energy efficient as possible. He announced the goal during a July 24 news conference at Old St. Mary’s School on Michigan Avenue. 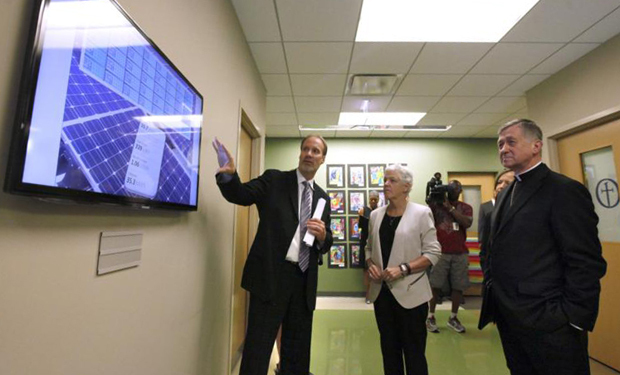 The news conference was held after Chicago’s archbishop toured the school with U.S. Environmental Protection Agency Administrator Gina McCarthy. “While it is a considerable undertaking, we have to set an example that it can be done and must be done if we are to fulfill our sustainability goals,” Archbishop Cupich said of the benchmarking goal. It is an effort to answer Pope Francis’ call in his encyclical on the environment, “Laudato Si’, on Care for Our Common Home,” the archbishop said. Through benchmarking, churches, schools and other buildings will be evaluated for their water usage, energy efficiency and greenhouse gas emissions. Data will be tracked using the EPA’s free Energy Star Portfolio Manager. Some buildings in the archdiocese are already eco-friendly. For example, St. Joseph College Seminary, completed in 2012, holds a gold LEED certification — LEED stands for Leadership in Energy &Environmental Design.” It also has a green roof and high efficiency lighting control and heating systems. In addition, the field operations center for Resurrection Cemetery has been heated with a solar system since 1978. Old St. Mary’s School itself was built in 2011 as an eco-friendly building. Solar panels on the roof help generate electricity for the school. In the summer months, when school is out, the building receives an average of 40 percent of its energy from the panels. Archbishop Cupich praised his predecessor, the late Cardinal Francis E. George, for beginning the work to make the archdiocese more energy efficient. For the past three and a half years, the archdiocese’s facilities office has worked with parishes and with schools to make them more energy efficient with projects related to boilers and heating. Chicago parishes have received a little more than $1 million in rebates from Peoples Gas since 2011. Those rebates go toward paying for highly energy efficient systems. In the suburbs the archdiocese works with Nicor Gas and parishes have earned $183,000 in rebates. An estimated 28 percent of parishes — 97 of 350 — have participated in the utility rebate program in the Peoples/North Shore Gas and Nicor Gas territories. The new boiler and heating systems must meet certain criteria before they can receive a rebate. The money for the rebates comes from a “tax” on energy bills. Typically a new hot water or steam boiler is installed along with high-efficiency burners, steam traps, insulators and heating system controls. Parishes often see about a 25 percent reduction in costs after installing the new systems. All of these efforts are fundamental to the Catholic Church’s social teaching on caring for our common home and our neighbors, Archbishop Cupich said. “Those who do not think religious organizations should have an opinion on climate change misunderstand the purpose of the former and the moral dimensions of the latter. We are called to care for those sickened by pollution, house those displaced by environmental calamities and heal the spirits of those, especially our youth, who are disheartened by a world where human survival is now in question,” he said.